Released Date: ‘30th’ of May 2018. Singer, songwriter and musician Mark Davison founded Cubic Feet in the eighties, and his new band released their debut single Across The River in 1989, which was the start of a recording career that spanned three decades and saw the band enjoy a degree of mainstream commercial success. Two years later, Cubic Feet returned with their debut album Across The River, with their sophomore album Passenger in Time following in 1995. Cubic Feet returned with their third albums Inside Rail in 1997 and four years later, returned with their fourth album Superconnector, which was also their swan-song. After a gap of eight years, Mark Davison returned in 2009 with a new band Nuke The Soup, who released their debut album Make Waves Not War on Meteor Records. The album was well received and was a new chapter in Mark Davison’s career. However, he still had unfinished business with Cubic Feet. In 2011, Cubic Feet returned with the retrospective The Living End-Then And Now, which featured a mixture of their best known songs and previously unreleased material. This brought the curtain down on the Cubic Feet story, and meant that Mark Davison could concentrate on his new project Nuke The Soup. Despite that, the best part of seven years will have passed before Nuke The Soup, return with their sophomore album Deeper, on the ‘30th’ of May 2018. Joining Mark Davison is an experienced band of musicians, who play their part in what’s a carefully crafted album that reflects on the subject of mortality, and its anguish and exultation. However, Deeper which is a very personal album from Mark Davison doesn’t descend into darkness and despair, and there’s a degree of hope on Nuke The Soup’s sophomore album. “I did not set out to write an album with a recurring theme as dark as mortality, but that’s where the muse led.” That come as no surprise as life hasn’t been easy for Mark Davison him over the last few years. Having overcome these issues, Mark Davison was able to get back to what he’s been doing for four decades, writing and recording songs. This he’s been doing with songwriting partner Woody Lissauer, and the pair penned Oceans and Mountains, which was inspired by Feel Of The Ocean which is another song on Deeper. Oceans and Mountains was completed in the mountains of Colorado and became part of an album that has been inspired by a variety of sources. Joining Oceans and Mountains and Feel Of The Ocean are the occasional orphan song from Mark Davison’s time with Cubic Feet. When these songs were written, they weren’t suited to previous albums, but were perfectly suited to Deeper. Other songs, were inspired by a variety of subjects, including mortality and political figures right through to Mark Davison’s love of water, outdoor sports, including surfing and his joie de vivre. These songs would become Nuke The Soup’s long-awaited sophomore album Deeper, which was recorded over a two-year period. Recording of Deeper took place at Mark Davison analog studio, which is situated in his basement, and is stocked with vintage equipment. This was put to good use by the group of talented and experienced musicians who were part of Nuke The Soup. This included drummer Chester Thompson who has previously worked with Frank Zappa and Genesis, while guitarist Gerry Leonard was once part of David Bowie’s band. Taking charge of production of Deeper was Fugazi drummer Brendan Canty and Kevin Killen whose worked with Kate Bush, Peter Gabriel and David Bowie. They play their part in what’s a carefully crafted album that features elements of rock, reggae pop and blues which took shape over a period of two years. During that two-year period, the world became a different place, and Mark Davison comments on these changes during Deeper. 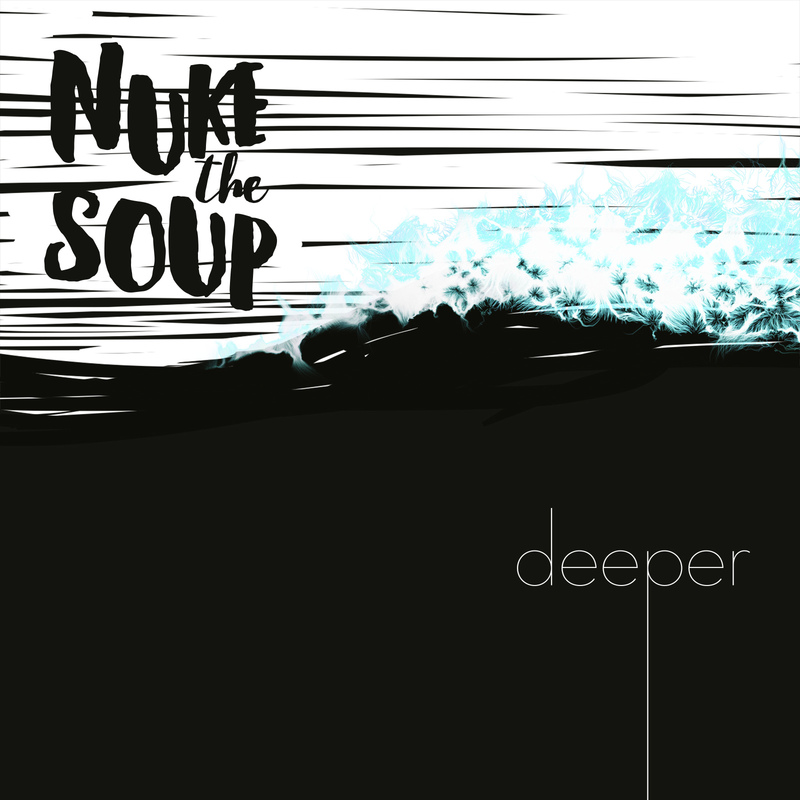 It featured eleven songs by the time Nuke The Soup’s sophomore album Deeper was completed. Deeper opens with Network, which comments on how the media has managed to commercialise human tragedy over the last few years. This is something that musicians like Gil Scott Heron forecasted forty years ago, and sadly, has come true. Nuke The Soup pick up the story, and against a skanking and rocky arrangement Mark encourages viewer to turn off television and engage more fully with life itself. Very different in the cinematic sounding Feel Of The Ocean has been inspired by Mark Davison’s love of surfing. There’s a degree of urgency to I’m Not In Love as drums crack and power the arrangement along, as washes of organ accompany Mark Davison’s defiant vocal on this anthem. Island is rocky and full of social comment as Mark Davison comments on the problems facing an ever-changing world. Deeper finds Mark Davison reflecting on his life, and indeed mortality, as he delivers an emotive vocal against another rocky arrangement. It’s all change on the ska-tinged Bugs, which deals with subject of addiction, while Mark Davison sings about ageing on the poppy Better Than I Was. Caught Inside is rich in imagery as elements of rock, pop and funk are combined by Nuke The Soup who don’t spare the hooks. Hilary is proof that Nuke The Soup don’t always take themselves seriously, as they fuse pop rock, blues and satire. Feed The Fire finds Nuke The Soup heading in the direction of ska, while Oceans and Mountains which closes Deeper is another song full of imagery inspired by Mark Davison’s love of the outdoor life. After a nine-year absence, Nuke The Soup return with their sophomore album Deeper, which will be released on Meteor Records, on the ‘30th’ of May 2018. To some extent, Deeper is a very personal album from Nuke The Soup founder Mark Davison. Having said that, Mark Davison doesn’t descend into darkness, despair or self-pity on Deeper, and instead reflects and ruminates as he realises that middle-age has crept up on him. This is a sobering realisation and can be hard for some people to come terms with. However, there’s a degree of hope and sometimes joy on Deeper as Mark Davison reflecting on life and his own morality, while other times he addresses the problems facing the world. Other songs offer light relief and have been inspired by Mark Davison’s love of the outdoor life, and hobbies like surfing. Indeed, some of the songs on Deeper were written whilst surfing in the Dominican Republic. In between catching waves, Mark Davison wrote the lyrics, and this was the start of a two years musical journey. The next part of that journey took place in Mark Davison’s basement studio which was filled with vintage equipment, and was where he wad joined by an experienced, talented and versatile band who recorded Deeper, which is a carefully crafted genre-melting album. Nuke The Soup fuse elements of rock, reggae, blues, funk, pop and ska on eleven new tracks on what’s their first album in nine years, Deeper. It’s an album of carefully crafted songs that are variously melodic, thought-provoking and full of social comment, where Nuke The Soup don’t spare the hooks on their long-awaited followup to Make Waves Not War. ← THE BEGINNING OF THE END: THE EXISTENTIAL PSYCHODRAMA IN COUNTRY MUSIC (1956-1974)-RECORD STORE DAY 2018.